Sometime in May, I read an article about a young fellow named Marcel. He had broken the Guinness World Record for fastest typing on a smartphone and it was achieved with an app called Fleksy. Up to that point, I had tried on a lot of keyboards for my phone (previously), because I was not very happy with the one it originally came with. The article also mentioned that the creators of this particular keyboard were Greeks and as a Greek myself I felt patriotic and proud and decided to give it a try. And that was it, I was hooked. Fleksy had got me excited for typing. The thing is, I don't usually get excited about apps. I see them as a tool for the everyday digital activities such as mail, notes, transport, social and general media, etc. This is the reason why I have the minimum amount of apps on my phone, each one of them serving its own purpose. I don't see the point in having a phone full of apps that I do not use, but that's just old me. Needless to say, Fleksy is the only keyboard I have installed on my phone. 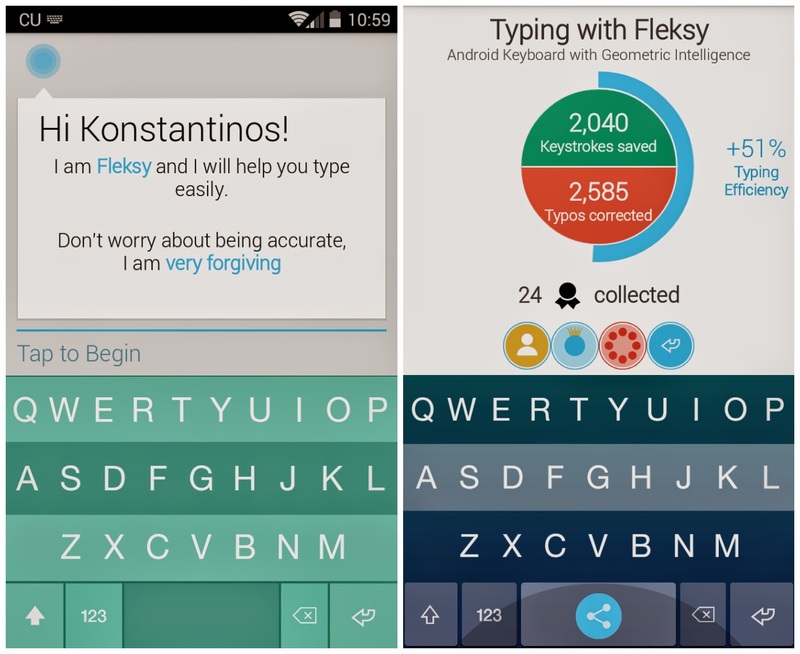 Fleksy makes the boring task of typing an enjoyable experience. First of all, the design is minimal and elegant as you can see in the screenshots above. There is the option of a smaller size keyboard and also an invisible one. The gestures are innovative but they need a little practising at first; after a little while, every swipe feels natural and smooth. Emojis, colourful themes, multiple languages, earning badges while typing and powerful auto-correct complete the package that is Fleksy. As far as I am concerned, it is the best keyboard out there. Download it here.